OCaml 4.06 has, by default, immutable strings. This necessitates some changes to "More OCaml" ("OCaml from the Very Beginning" is unaffected). The paper and kindle books (on Amazon), as well as the PDF e-book here, have been updated, together with the online resources. The new code works on any version of OCaml starting from 4.02.0. If you are an existing customer, and have not received an update email, please contact the author using the form on this website. How do we decide where to put ink on a page to draw letters and pictures? How can computers represent all the world's languages and writing systems? What exactly is a computer program, what and how does it calculate, and how can we build one? Can we compress information to make it easier to store and quicker to transmit? How do newspapers print photographs with grey tones using just black ink and white paper? How are paragraphs laid out automatically on a page and split across multiple pages? In A Machine Made this Book, using examples from the publishing industry, John Whitington introduces the fascinating discipline of Computer Science to the uninitiated. 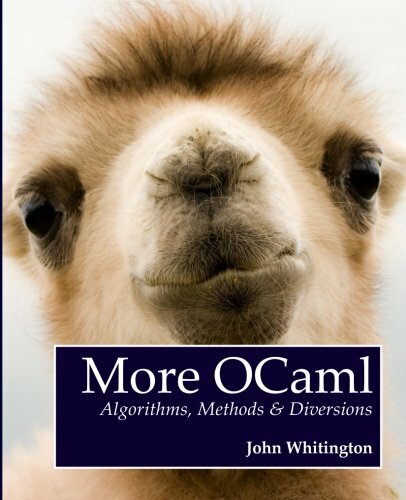 More OCaml: Algorithms, Methods & Diversions is now available on Amazon at $39.99 or less, or as a DRM-free PDF eBook for $14.99 at ocaml-book.com, where you will also find sample chapters, and the exercises and examples to download. In More OCaml John Whitington takes a meandering tour of functional programming with OCaml, introducing various language features and describing some classic algorithms. 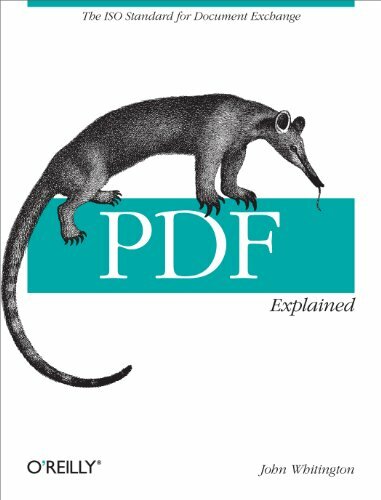 The book ends with a large worked example dealing with the production of PDF files. There are questions for each chapter together with worked answers and hints. More OCaml will appeal both to existing OCaml programmers who wish to brush up their skills, and to experienced programmers eager to explore functional languages such as OCaml. It is hoped that each reader will find something new, or see an old thing in a new light. For the more casual reader, or those who are used to a different functional language, a summary of basic OCaml is provided at the front of the book. If you buy the book, please do consider leaving a review on Amazon, which you can do even if you buy just the PDF eBook. 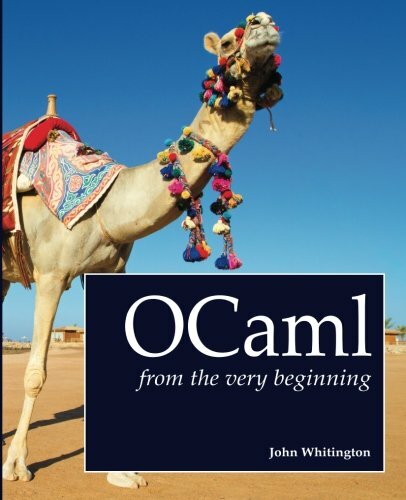 Reprinting of "OCaml from the Very Beginning"
Owing to the print-on-demand process we're using, it's simple to update the book to fix the few errata which have been pointed out by kind readers since publication. The new text is now live on Amazon, the Kindle Store, and our website. To update the Kindle copy, go to "Manage My Kindle" on Amazon (there is no automatic update process). If you have purchased a PDF e-book, just email us for an updated PDF (it is possible to notify customers of an updated version by email, but since none of the errata are serious, we've opted not to do so). And finally, if you have found mistakes in the book (or have any suggestions for the next edition), please do tell us, using the contact form on the website. They're not really a substitute for the book but, when learning, it's always helpful to go over things twice, particularly using a different medium. OCaml from the Very Beginning (204pp, paperback) is now available on Amazon for $34.99 / €29.99 / £24.99, as well as an e-book from ocaml-book.com for $14.99. Here are preview chapters and a .zip of the examples and exercises. In OCaml from the Very Beginning John Whitington takes a no-prerequisites approach to teaching a modern general-purpose programming language. Each small, self-contained chapter introduces a new topic, building until the reader can write quite substantial programs. There are plenty of questions and, crucially, worked answers and hints. OCaml from the Very Beginning will appeal both to new programmers, and experienced programmers eager to explore functional languages such as OCaml. It is suitable both for formal use within an undergraduate or graduate curriculum, and for the interested amateur. Please do review the book on Amazon if you have the chance. 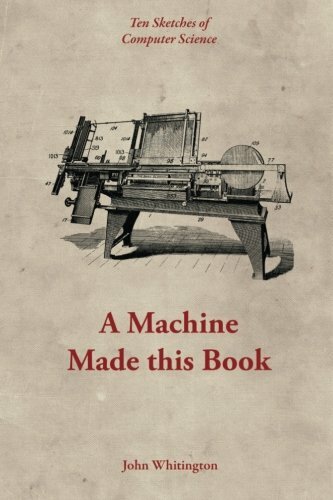 Or, download the PDF version of "A Machine Made this Book" for free.